Sondheim will forever always be my favorite composer. His musicals transcend the human experience and emotions unlike any other writer...and he does it through lyrics. He does it through empowering ballads and amazing lyrics. Whether it's the first time seeing a Sondheim show or the 20th, I always know I'm going to be put through an emotional rollercoaster. 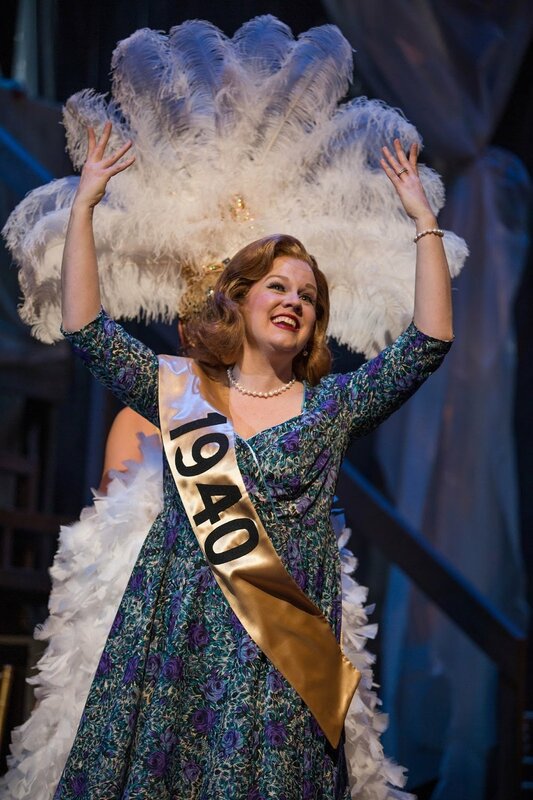 Although I felt slightly confused during parts of this recent production of Follies at Artistry theater, after a little reading and research I now realize how utterly brilliant it is. Follies takes place in 1971 and the legendary Weismann Theater is slowly falling apart after a triumphant run. The theater will be taken down and Broadway impresario Dimitri Weismann arranges a reunion to celebrate its former glory. The reunion features actors, singers, dancers, and people who made famous Follies in the years. As patrons continue to file in for a night of memories, they sing some of their favorite numbers they used to perform as the younger ghost versions of themselves dance around them. That being said the story focuses primarily on two unhappy married couples and the lengths they will go to be happy. The show opens on the torn down theater. With this idea it can be really easy to make this look terrible and torn down but I think scenic designer Eli Sherlock hits the mark perfectly with an almost organized destructive look. It could have very easily looked trashy and terrible but he goes above and beyond with the second act as the theatre goes back in time to when the curtain was red and not ripped along with a clean white staircase for plenty of dramatic entrances. The main four leads really are the ones who stand out for me the most however I really want to focus on the two leading ladies as they made the biggest impact for me personally. Starting with Caitlin Burns who plays Sally Durant Plummer. Burns perfectly encompasses this role as someone who longs for the old days and her past life but hiding it through a smile that is about to crack any second. Burns really held the audience in the palm of her hand during the power ballad "Losing My Mind." The raw emotion she had on stage was perfection. Next to Burns, the next highlight for me was Wendy Short-Hays who played Phyllis Rogers Stone, Sally's old friend and also the wife to her current...crush/ex-lover. I think this is probably the best role in the entire production just due to the sheer complexities of her character. She's a woman who has been married for what seems like an eternity to a man who she feels does not love her anymore, and yet she stays with him. Her song "Could I Leave You?" is hands down one of the best written songs in the production, probably next to "Losing My Mind." During this song Hays portrays a wide variety of emotions from long lost love, nostalgia and bitterness to her marriage. She embodies the empty shell that the emotions of the outside world cannot crack until she finally does at the end of the play. The show is so rich and generous in providing older seasoned veterans of the stage an opportunity to hop back on and to me that's very important. It's refreshing to see older actors get a chance to shine on stage for an entire production versus a quick scene or two with a monologue of wisdom and then never to be seen again. That being said, it isn't done often. Follies is one of the most complex musicals I've seen in quite some time. The relationships between the characters (whether it's deep or through a few interactions in one scene) are real, raw and unique. It begins to feel even more complex when the younger versions of themselves are on stage with them. A critic from one of the revival productions on Broadway stated once that there is no "on the fence" with Follies, either you are a passionate fan or hate it. While this production didn't leave me absolutely blown away, I think they still did a decent job with the complex ideas that the story brings. Follies is a production that isn't done often so if you've never seen it or experienced the music I certainly recommend seeing it before they take their final bow.